The key though is that we have dedicated, consistent buyers. You'd have to buy them all, and couldn't pick and choose only the ones that you like. As was mentioned over in the print-on-demand thread, there's a large discount when buying the print-on-demand cards in bulk (1/2 price or less) when compared to a single card purchase. The idea is that we can pull together at least 10 purchasers, to drop the price from $10 to $5/card. And if we can pull together 20 purchasers, it would drop it to $4/card. The crux of the problem is the cost to re-mail the cards back out to everyone. My idea to minimize that is one shipment for a weekly set of cards. With all the week's cards together, it lowers the postage cost per card. Checking some prices online, it looks like I can do postage, mailer, top-loaders, penny sleeves, for about $3.50. With the current Disg-race cards, they have been very consistent of late with 3 cards per week. Disg-race ends this week and a new set starts next week. (I'll guess a name of "The First 100 Daze"). Dave G. wasn't sure what form next week will take, but I think at this point we'll have to guess 3 new Wacky cards. Something to be aware of is how long it'll be before you'll get your cards. They already take forever to ship when using smart-post. The recent ones have taken 2 weeks to get delivered to me after their on-sale date! Add a few more days before all cards for the week show up, and several more days after I re-mail them before they get to you. Looking at ~3.5 weeks from the on-sale date. (if everyone doesn't pay in time, I'll have to forego the purchase though. I don't want to get stuck with extras. I'll post an early notice and refund everyone). 4. After 2 week's worth of Wackys have arrived, I'll pack them up and mail them out to everyone. 5. Rinse and repeat - for as long as Topps is producing these cards and we have enough members in the Club to make it worthwhile. The key though, is that I have dedicated, consistent buyers. You'd have to buy them all, and couldn't pick and choose only the ones that you like. As was mentioned over in the print-on-demand thread, there's a large discount when buying the print-on-demand cards in bulk (50-60%) when compared to a single card purchase. The idea is that we can pull together at least 10 purchasers, to get to $5/card. And if we can pull together 20 purchasers, that would drop it to $4/card. The crux of the problem is the cost to re-mail the cards back out to everyone. My idea to minimize that is one shipment of the weekly lot of cards. With all the week's cards together, it lowers the cost per card. Checking some prices online, it looks like I can do postage, mailer, top-loaders, penny sleeves, for about $3.50. I'll round that to $4 for my effort. 4. After the week's worth of Wackys have arrived, I'll pack them up and mail them out to everyone. Who's In? Do we have 10? or maybe 20? Count me in for one of each card. Thanks for doing this. Same here. One of each card. Thanks!! Yep. This is Wackys only. This makes 9. 1 more person and the Buyers Club is a "go"
I am in!! cant pass up a deal!! And there's 10! You're all locked in and I'll send out details in a PM. Likely tomorrow. If 10 more are interested, we could do a 20 buy, but only if there's 10 more claimed. Anything less wouldn't be viable. Have to wait and see. If we can get 8 more cards claimed by Sunday, I can work you in. If it would lower the postage rate any, or be more convenient, I wouldn't mind if my three weekly cards were all put into one box, as opposed to three separate plastic boxes. I am hoping we still get our wackies in those acrylic boxes Topps has been using as of late as I like them to display cards. I consider them to be a small perk you get for purchasing these high end cards. I don't think they add too much weight; but I could be wrong. Whatever is best for the group though. I expect there will be only one acrylic box per order. A big thank you to Patrick for doing this! I would have offered to do it myself, but I have to pay sales tax, which just boosts the price. Pat suggested 1 shipment of 6 cards every 2 weeks as a way to drop the cost a little more. Not sure how everyone feels about that? I prefer but acrylic boxes but can live without them if that's better for the project. Shipments every two weeks to cut down on postage is fine with me. But if that is the decision; why not send six cards in one of the acrylic boxes and not 6 top loaders. You would have to purchase the top loaders and the boxes are provided by Topps. those snap boxes are nice, but as Pat indicated, that's not going to be possible when distributing single bulk order purchases out to 8 members in the club. I was going to propose going in the other direction actually. I've got a good pile of 'used' top loaders around. (why, oh why, do people use cellophane tape on these when shipping? it never comes off and they're ruined!!). If people don't mind ugly toploaders, I'd knock 50¢ off a week until I used them all up in a few weeks. Two cards can easily fit in one toploader, so I'd double up where possible as well. My thought with this club is minimizing the price/card for everyone. Then how to display or store is up to you. it'll take 10 orders from topps before I'd have enough snap boxes for everyone. Options would be to ship every 3-4 weeks, with 10 cards in a snap case. Or still ship weekly or bi-weekly and round robin between toploaders and snap cases as they arrive. I am grateful that you are doing this, and am OK with whatever used ugly top loaders you have! I'll take two if you can get it up to 20 buyers, and ugly top loaders with six cards every two weeks is fine with me. I'm good with top loaders and every two weeks. have you listed in the 2nd set of 10.
if six more cards can get spoken for in the next day, we can do the 20 Count order @$4 / card. C'mon, everyone! 6 more isn't that much. Topps was selling 300 - 400 of these each time around. Count me in for two (or three if possible) great idea ! will do. 2, with the potential for 3, depending how many others would still like to join. 3 cards to claim left. I would be interested in one of each. Thank you. 2 to go. But, I think we can close the gap to 20, even if no one else jumps in today. So, I'll plan out the 20 @$4 for everyone! W00t! Go ahead and add me in as well... I will take 1. Meaning, you will be on your own to purchase any special 'event' cards that do not offer bulk discount, tomorrow or down the road. We will see for sure on Monday, but I want to give everyone a head's up on this scenario. Let me know if there's any questions or concerns on this, and if you all feel this is a good plan. 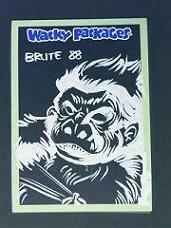 Why not print on demand commissions for not for future Wacky Packages ANS Wacky Packages entries? Sounds good to me. We purchase the special set on our own if there is no bulk discount; but hold for payment instructions from you if there is a bulk discount. Will you be sending out payment instructions today for the first week's 3 cards? Can we pre-pay for two weeks at a time as you will shipping every two week? Can we do Paypal Gift to save you those fees?